Back in 2000 Belgian band Mintzkov won Humo's Rock Rally, a big national band competition. A bright future was lying ahead of them. That didn't quite happen in terms of popularity and fame. They still are relative unknown band outside Belgium. That is actually quite surprising and unfair since there's absolutely nothing wrong with their music. They fit right in with other big Belgian bands like Soulwax, Millionaire and dEUS. 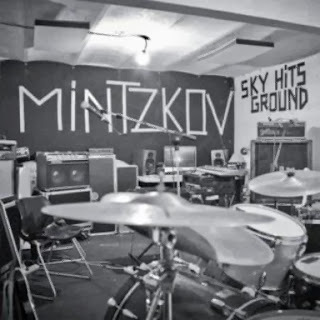 Mintzkov are especially compared to that last band, maybe even too much. However it is not surprising, since the bands have many things in common and zinger Philip Bosschaerts sounds a lot like dEUS' Tom Barman too. This isn't any different on their fourth long player Sky Hits Ground, that they produced themselves this time. Just listen to the sharp but beautiful 'Arial Black'. This song also shows they do have their own sound. Keyboard lines are used next to guitars in a creative way. It is always tasteful and subtle like all the other instruments. The band knows when to hold back and prevents that everything is clogged. Instead the different parts are squirming around each other as you can hear in the heavy 'Runner's High'. A while ago the band had to overcome the heavy loss of their former guitar player Bert van den Roye. This has clearly found its way into the record, which is often dark. 'All Names Have Been Changed' and 'Sky Hits The Ground' are sad and melancholic songs. This doesn't mean the whole album is dark and heavy. It also has songs like 'Arena', that has a nice, gritty and edgy groove, and the beautiful sultry 'Word Of Mouth'. With Sky Hits Ground Mintzkov prove again they are among the best bands Belgium has to offer, which is quite something. Since with the apparent inexhaustible stream of talented and qualitively great bands that are from there, this says a lot. And the comparison with the great dEUS is nothing bad at all. Especially not when you are matching up to them. It's about time that Mintzkov get what they deserve outside Belgium. So go see for yourself at one of club shows they are playing in coming months. Listen to Sky Hits Ground on Spotify.